Defending Gander Outdoors Truck Series champion Brett Moffitt‘s hot streak continued on Saturday afternoon (March 23) as came away from Martinsville Speedway in third place. The Grimes, Iowa native has now finished in the top five in three consecutive races and six of the last seven races dating back to last season. Despite the strong finish, Moffitt felt he left some on the table. The 26-year-old ran in the top five for most of the first half of the race. When a caution flew with 23 laps to go in Stage 2, Moffitt stayed out while nearly everyone else on the lead lap pitted in an attempt to score a stage win and a playoff point. Meanwhile, all but one other lead lap truck pitted. He only managed to finish the stage in fifth, and he was one of the few to pit during the stage break — giving up all of his track position. 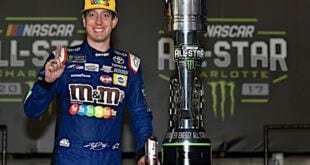 Despite having fresher tires than everyone else, Moffitt was only able to work his way back up to the third position, even though several late-race restarts gave him opportunities at race winner Kyle Busch. “I think if the whole stage had gone green then we would’ve been better off,” Moffitt said. “We didn’t have good short run speed, but we had a lot of long run speed. We were really good. But at that point, once you get 60 laps on them and heat cycles, the tires are basically even. The result was Moffitt’s third straight top five at Martinsville, and he has never finished worse than sixth at the track. “It was unfortunate we lost a lot of track position with our pit strategy, which it could have worked. Obviously, it didn’t,” Moffitt said. “I felt like we had a Silverado strong enough to compete with Kyle [Busch] for a race win so I’m pretty bummed with finishing third. 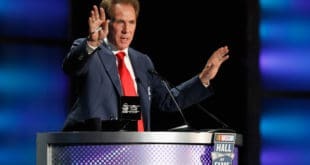 The great start to the year comes after a tumultuous offseason for Moffitt, where he lost his ride at Hattori Racing Enterprise to Austin Hill before landing at GMS Racing. At one point in Saturday’s race, Moffitt found himself being held up by Hill for several laps before he used the bumper to get around his former ride.